Each vehicle should have located on it the original paint colour code. These codes can be on a metal plate or on old vehicles a sticker. To help in ordering the correct colour, please find and use the Paint Code Identification. Bearing in mind that the vehicle might have been resprayed in a different colour. Colour codes can be located in different places on a vehicle depending on the manufacturer and model. The diagram below shows the mostly likely places to find colour codes. a) Check the list for the manufacturer. b) The manufacturer will have a series of figures: 1-2-3. 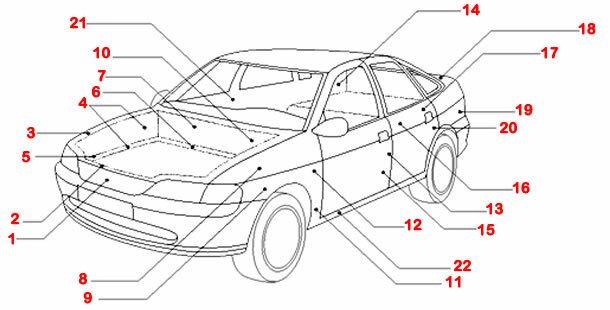 These figures refer to the possible location on a vehicle where the code can be located.